I remember in 2005 talking to a money manager who formerly had been in charge of a $200 Million dollar bond portfolio for a large mid-west bank. Somehow our conversation got onto the Federal Reserve and somehow I brought up the fact that banks, through credit expansion (otherwise known as fractional reserve banking), create money out of thin air. This manager did not believe me when I explained the fractional reserve banking process – and she was incredulous. I was so taken aback that it seemed surreal to me. I could not believe she – who worked at a high level in a bank – was so clueless as to not understand one of the basic underpinnings of how our centrally controlled banking system works. I shouldn’t have been so completely surprised. Years earlier I had been with a big time money manager in New York where the same thing occurred, but I had written that off since he was a private trader, not a significant functionary of a BANK. My 2005 money manager should have known better, or so I thought. At the very least she should not have been so aghast, so oblivious. This event in 2005 really affected me. I had been active in libertarianism efforts for some time. But the stark ignorance of such a basic reality of how money works in the current banking system – by a banker – that threw me. In 2007 on the campus of the University of Michigan, then Presidential Candidate Ron Paul said three important words during his speech, “End The Fed”. The crowd at U of M’s Central Campus erupted. They began to chant in unison, “End The Fed, End The Fed”. Ron Paul later recounted that he was surprised that so many understood the problem with the Federal Reserve. Mass Ignorance was melting – and this was new to Dr. Paul who had been banging this drum for 30+ years! During that 2007 campaign Dr. Paul took a lot of heat for attacking the Fed. Up until that time the Fed was merely some shadowy creature that very few people – shockingly including financial professionals – understood. But now this was changing. Fast forward to today and there still exists a massive amount of systemic ignorance. But the absolute dark absence of understanding has shifted toward the light of knowledge. Those of us who have been watching this closely for a long time can see the shift. While most financial professionals still cannot explain our money system in a proper Austrian Economic outline, there are fewer and fewer I come across who are oblivious to the fact that banks indeed do print money out of thin air and Central Banks are a key problem. In 2008 and 2009 the Fractional Reserve system nearly collapsed. It was shored up with more of its own toxic lumber. It was exactly like putting more drugs in the veins of a drug addict. And, as we Austrians know, the slow-kill stays in motion yet today. Before 2007-2009 most people could not believe the shocking fact that Fractional Reserve Banking was a real thing. My early presentations were rebuffed with the hilarious statement, “They would never let such a system exist” (to which I would point out that “They” not only created that system but were dependent on it). Now, a greater number know that Fractional Reserve Banking is unfortunately true and real. By my evaluation 2010 through 2012 has inspired a world wide shift toward competing currencies. The US Dollar, which only a few years ago was the de facto reserve currency of world trade, has slipped from being the primary Unit of Settlement in most world trade. Today, China, Brazil, Japan and a growing list of other countries do not use the US$ as their de facto Unit of Settlement and this movement is growing (meaning the US$ is slipping further). Furthermore, the International Monetary Fund’s Special Drawing Rights (SDRs) have reduced their dependency on the US Dollar by reducing its part in their “bucket of currencies” from 65% US$ only a few years ago to about 40% today. What this all points to is that Central Control of Money is in retreat. Only those of us alert enough to the systems details see what is really happening. We see currency controls tightening – who else watches this? Not the guy who runs my local deli; not your normal stock broker, either. Those of us who are alert to what is happening need to see the increasing desperateness of the Central Controllers as a good thing. They have no choice but to increase the one thing they know how to do – apply stronger Central Control. Eventually, I believe, this will be felt as intolerable to the ground level population and then change will (or at least can) occur. Of course, I could be wrong and all instincts of Property and Freedom could be bred out of us but I think that human nature will not let that happen without a fight or revolt. Central Controllers are discrediting themselves right and left (pun very much intended). The recent whipsaw in signals from the Federal Reserve to “taper” or not discredited the Fed. Obama’s nearly successful attempt to “significantly attack Syria” deeply damaged his image as the “Bringer of the Peace”. The Basics of Austrian Economic Understanding are – here and there – appearing in the media, albeit nascently. Socialism is coming to be understood as a system of consumption, not production. More and more people are realizing that credit lines are not the same thing as cash flow. Due to the excellent efforts of Austrian Economic Scholars, significantly led by Dr. Hans-Hermann Hoppe, it is now more appreciated that Property is the key right upon which all other rights depend (Please see Dr. Hoppe’s The Economics and Ethics of Private Property as an excellent starting point on this avenue of scholarship). Professor Butler Schaffer’s vision of a “more horizontal” voluntary-based social fabric is coming into focus and replacing the old, tired vertical hierarchical structure that has finally bore its most obvious and inevitable fruit – a noticeably aggressive and growing tyranny. For anyone awake, we see full blown tyranny right around the corner (Please see Dr. Butler’s excellent book, Boundaries of Order, for more on this point). So what is next in the Austro-Libertarian Movement? Recently, I had the privilege to again attend the annual meeting of Dr. Hoppe’s Property and Freedom Society in Bodrum, Turkey. There he gathers thinkers, scholars, activists and supporters from around the world who, over the course of five marvelous days, deeply discussed this very question. In fact, I found it to be the key focal point throughout many conversations I had in my days there. The answer was not found in the debate themselves, whether the topic was Bitcoin or Expatriation but rather that there was so much ground level activism all over the world. Some, like Dr. Thorsten Polleit of Germany are world class scholars that focus on the Monetary System systemically. Others, like Roman Skaskiw, were more focused on Bitcoin as a harbinger of social change. Joakim Fagerstrom and Joakim Kampe of Mises-Sweden have been focused on education and media penetration. In Switzerland, Thomas Jacob has been working on creating a new gold coin Swiss Franc that would be a side-by-side alternative legal tender. There is a growing world wide activism and networking that is spontaneously taking hold and accelerating; this is very inspiring. Now, thanks to the roots established by Lew Rockwell and the host of dedicated scholars and staff at Mises.org in Auburn, Alabama, there exists Austrian Economic and Austro-Libertarian activism that is happening in a horizontal, decentralized way, all over the globe today. Dr. David Howden, who teaches Austrian Economics at St Louis University Madrid, Spain, is helping to organize a Canadian Austrian Scholars Conference in Toronto that will be held in November 2013. Last summer, there was for young students, a Mises Summer School in the Netherlands put on by Frank Karsten and Jeroen de Witte of Mises Netherlands. In London, Andy Curzon is currently organizing an “Interim Property Freedom Society” meeting hopefully for this December. Andy envisions a Mises.org-type organization focused on the UK. Everywhere I look in Sweden, Hong Kong, Germany, Brazil, Lithuania, Switzerland, Ecuador, Poland– and in Vienna, Austria as well – the Austro-Libertarian Movement is growing. 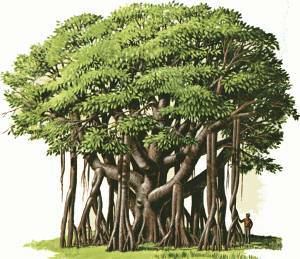 What is next is very much like the Banyan Tree, that strange tree I first saw in Hawaii, where the branches send down root-growth that then penetrates the ground below and becomes part of the overall root structure. Over time, each Branch-Root becomes indistinguishable from the initial, original trunk. This way the tree branches out and becomes more stable as it grows. Standing under a Banyan Tree is a little like standing in an invincible forest. Our Austro-Libertarian tree honors its trunk – in this case Mises.org, Auburn, for making all of our efforts more stable and more influential. This is just in time. People around the world, increasingly, are becoming aware where they want to escape from. They urgently need to have a clear understanding of where they need to move to. Otherwise, they will simply re-create the same mess again. Now, for us, we only need to nurture each others efforts. We’ve got the goods to show people where to focus. Activism together with Networking is our key paradigm to push right now. Activism in small forms, like simply speaking up, lending a book, or supporting one another to learn, or attending an online Mises Academy course, or Tom Wood’s Liberty Classroom, or sponsoring a learning event in your home, town or city. Anything and everything helps – and works! Activism + Networking = Rapid Expansion of the Austro-Libertarian Movement. This is what is next. Dat fractioneel bankieren betekent dat er geld uit “thin air” geschapen wordt, is naar mijn mening niet correct. Wel is er sprake van meer krediet, maar dat is toch wat anders. Fractioneel bankieren leidt niet tot inflatie. In tegenstelling tot het opkopen van staatsschuld door de centrale bank. Maar zelfs dit zou in theorie afgelost kunnen worden.Jammer van het stuk. Dit leidt niet tot geloofwaardigheid.